Background: The MAD FIGS heard an interesting rumor... that evil coach Ron had a second job at a local 7-11 store. So the MAD FIGS decided that it would be worthwhile to try and find him and pay him a little "visit". Mission Objectives: Find Ron working at 7-11 and attempt to purchase large quantities of alcohol, even though he coached our high school team. Planning: Jacob picked up all the MAD FIGS and basically just drove around to various places. Execution: The MAD FIGS arrived at 7-11 at Blackstone and Bullard, where Ron was rumored to be working. Unfortunately, he was not on duty at the time of their arrival. So instead of bothering Ron, the MAD FIGS decided to hang around the store instead. Next to 7-11 is a used car dealership. 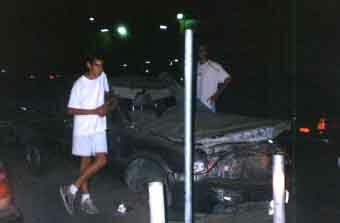 In the lot was an old car with broken windows and no doors. The MAD FIGS took a picture while holding various parts of the car, but in the background of the picture is a "Mystery Fig" - some say it's vinnardo, and some say it's Jacob. But more disturbingly, others claim, with good reason, that it is General Swift, who was not present at the mission! Two explanations are possible: 1, General Swift used his superior camouflage techniques to sneak into the photo undetected; and 2, his image somehow appeared in the photo, possibly as a result of the MAD FIGS psychic communication network. Another happening was a call to "The Answering Machine". This was discovered one day when Paul combined the Animal's and Jacob's phone numbers, producing a new number which had amazing messages left on its answering machine. Since Sasha had never heard the message, he called from the payphone outside 7-11. The Flash managed to take a photo of Scott Dogg laughing along with the message that later became a part of the MAD FIGS ID cards.